When corporate entertainment is done right, businesses stand to reap the rewards. It dazzles potential new business partners and give hard-working staff the end of season blow-out they so deserve. And, perhaps most importantly of all, it can put your company in the spotlight and enhance its reputation. But it’s a lot of pressure, isn’t it? Hosting corporate entertainment on any scale requires a great deal of preparation. And throwing a memorable party isn’t something you can do with a snap of the fingers. We’ve all been to our fair share of snooze-worthy business bashes. So, how exactly do you prevent the potential pitfalls when it comes to organising corporate entertainment? Corporate events have the edge on business meetings as they allow people to mingle in a relaxed, casual environment. Everyone is at ease. Networking is more natural. In order to keep the atmosphere light and breezy, consider recruiting the services of a top-notch comedian who can hop on the mic and deliver some rib-ripping jokes. Are you looking for something a little more sophisticated? A great way to wow the audience is by hiring a classical music band. This is guaranteed to show your guests what great taste and style you have. Add a group of well-dressed mixologists behind the bar to keep a wide selection of vibrant drinks flowing all evening long. 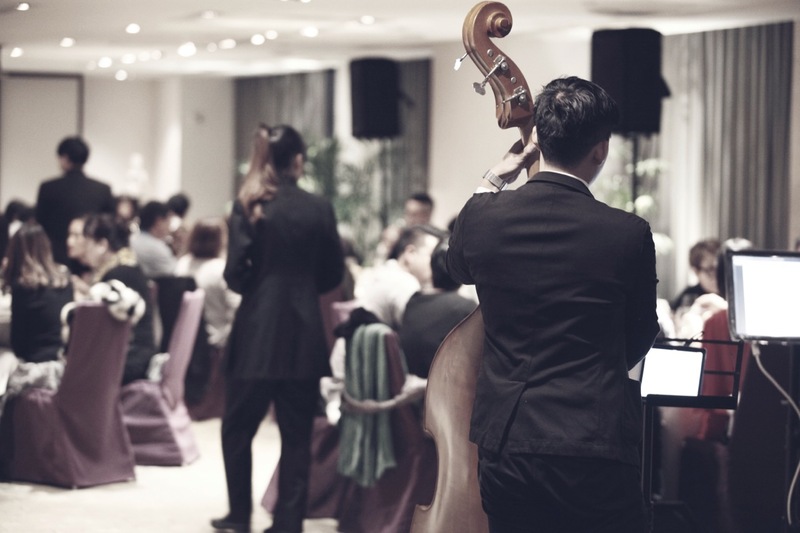 For a slightly more casual gathering with a twist, try a jazz band or string quartet to create the right atmosphere. Every party needs at least a little pinch of playfulness, right? There are many ways to loosen up your corporate entertainment and throw some frivolity into the mix. Singing waiters disguised as guests or caricaturists scribbling portraits of the people in the room. There are lots of playful choices for corporate entertainment. Lookalikes are also guaranteed to get the crowd nudging and nodding at one another, stirring up some great conversations. We’re all a little nostalgic at heart and you can turn your corporate event into a time machine. By hiring a Great Gatsby group, prohibition-era brass band, or New Orleans jazz band, you’ll have bags of nostalgia. Not many parties offer a throwback to another era. It might be a good idea to encourage a particular dress code to reinforce the wistful ambience of the evening. Season your corporate event with these key ingredients, and you’re guaranteed to put on a show that your guests won’t stop talking about. Whatever you’re looking for when it comes to corporate entertainment, you can find the best performers, singers and dancers right here at Silk Street. Drop us a line and we can help you host an event that leaves your guests grinning from ear to ear.